1. Stronger economy: China's factories are motoring again after a dismal start to the year, with a preliminary estimate of manufacturing activity hitting an 18-month high in July. "This is providing some hope that the Chinese government's mini-stimulus efforts to date have helped offset the impact of the property cycle and economic reforms that may be constraining short term growth," wrote Deutsche Bank analyst Jim Reid, in a market report. The U.S. government will report weekly jobless claims at 8:30 a.m. ET and new home sales made in June at 10 a.m.
2. Political risks lurk: The big risk for Europe's recovery remains an escalation in the dispute with Russia over Ukraine. EU officials are due to present options for much tougher sanctions Thursday, including measures that could restrict Russia's access to European financial markets, as well as arms and energy technology. France's Technip (TKPPY) said sanctions may hurt its profit margins this year. 3. GM earnings: General Motors (GM) said, in its earnings report, that it expects to pay between $400 million and $600 million to compensation victims of its faulty ignition switches, which have been linked to at least 13 deaths. As a result, GM will take a $1.2 billion pre-tax charge. The report comes one day after GM recalled another 718,000 vehicles. Other companies also reported early Wednesday. Dunkin' Donuts (DNKN) shares fell in premarket trading after the company missed sales forecasts, which Dunkin' blamed on faltering Japanese sales of Baskin-Robbins ice cream. Ford (F) shares moved higher after the automaker reported a quarterly pre-tax profit of $2.6 billion, including its first profit in Europe in three years. Shares of United Airlines (UAL) rose 2% after the carrier announced a 51% surge in quarterly net income . The airline also announced a $1 billion share repurchase program. Starbucks (SBUX) and Visa (V) will report after the close. 4. Tech movers -- Facebook, Qualcomm, AT&T: Facebook (FB) shares surged nearly 9% after posting earnings that blew away expectations. Qualcomm (QCOM) shares plunged 5% premarket, with worries over the company's business in China keeping investors on edge. Qualcomm is being investigated under China's anti-monopoly law. The tech firm said in its quarterly report that some clients in the country are "not fully complying with their contractual obligations." AT&T (T) slipped premarket after reporting earnings that missed expectations by a penny. Amazon (AMZN) and Pandora (P) will report after the close. 5. Central bank data breach: The European Central Bank said Thursday its public website had been hacked, leading to the theft of 20,000 email addresses and contact data left by people registering for events at the bank. It said the theft was from a database that was separate to its internal systems and no market sensitive data were compromised. 6. Wednesday market recap: U.S. stocks closed mixed Wednesday. 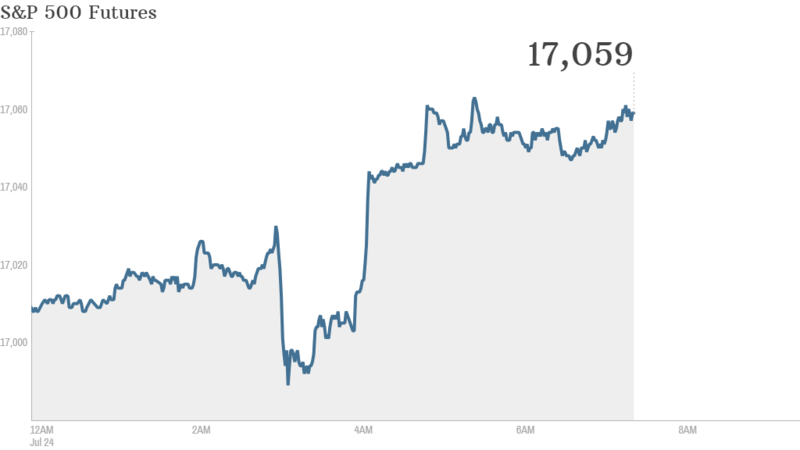 The S&P 500 hit another record high, landing at 1,987. That tops its previous closing record, set on July 3. The Nasdaq also ended higher, but the Dow Jones Industrial Average lost about 27 points.